Have you ever had to make something for someone you think is hugely talented artist, someone you look up too and making it scared the heck out of you to do so for fear it would not work or what you make would be inferior ? Well that was me in making my second puffy steam punk heart!. I procrastinated about it so much I just couldn't even start. The first one was full of mistakes but I wear it like my own badge of honor because I problem solved and got it made in the end. Because the first one HAD been hard to make that too was playing on my mind. Then two days ago I had the time...my desk was clear and the puffy heart I had puffed months before was sitting there waiting for me on my fire brick...so butane alight in one shaky hand and plumbers lead free solder in the other shaky hand I started...and guess what I made no mistakes and the whole thing came together easily!! I didn't burn my little acrylic light or file the back off it like I did last time, I remembered to leave tabs for the wings to attach too, I drilled holes exactly where I wanted them, I used all solder an no glue to hold all the components in place and it all only took hours (even though time for me to free to work on it took 2 days) rather then weeks like the last one. Even I am impressed with myself LOL. Here is my second steam punk heart necklace at last. Instead of a moving arrow I used moving gears and a cute moving propeller. It has proved hard to take photos off...too dark with flash off but colour not quite right with flash on plus little shadows here and there. This one is flash off and room light on and the shadows were less evident. 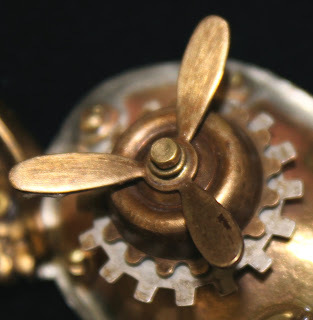 Under the propeller there are two cogs. All three components move as I have a small washer between each. A bit blurry sorry but that shows the gorgeous little brass keyhole filled with tiny watch parts and sealed in place with Ice Resin. Now all I need to do is get brave enough to give it to the person it was made for at the end of the month. HINT she is from Poland and will be touring Australia and New Zealand teaching mixed media art classes. She loves things that are steam punk! Wow Annette....this is truly amazing..
Annette, I am as always, in awe of your talent, imagination & skills. She'll love it, but if really MUST doubt yourself so much, pleeeease give it to me!!!! 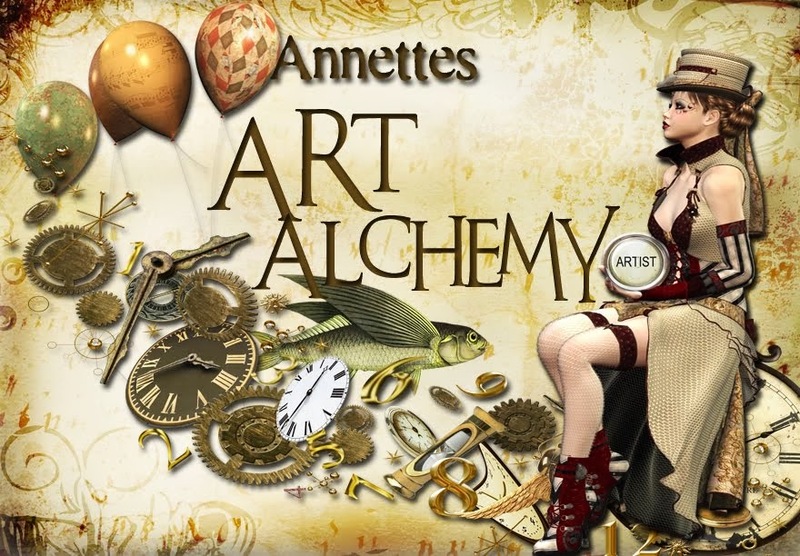 Congrats on being so successful with your second project, Annette! It's such a good feeling when it all comes together right. The necklace is beautiful, I really like the propeller. I think Finnabair will love it. Are you doing more of her classes this year? FABULOUS Annette, and 'she' who shall remain nameless, will be blown away! Fantastic! She will love it. Wow wonderful heart necklace totally unique. Steampunk Puffy Heart Necklac- "Burst With Love"